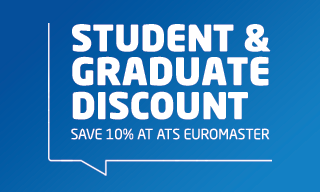 ATS Euromaster offers students & graduates a 10% discount on selected products and services on production of a valid NUS Extra Card or Graduate Extra Card. From tyres to suit all budgets and a wide range of products and services for your vehicle, we offer a fast, friendly and professional service. Just show your NUS Extra Card/Graduate Extra Card and receive 10% off selected products and services* at any one of our centres. Presentation of a valid NUS Extra Card/Graduate Extra Card will be required in order to obtain a discount. The Student & Graduate Discount is valid on in-centre purchases only and cannot be used to make purchases online. The Student & Graduate Discount can only be applied to in-centre prices. The Student & Graduate Discount applies to ATS Euromaster’s full retail price and cannot be used in conjunction with any additional offers and/or promotions. ATS Euromaster’s retail prices are inclusive of VAT. The Student & Graduate Discount applies to the VAT inclusive price. The Student & Graduate Discount is available to retail customers only. It is not open to Business Account customers. The Student & Graduate Discount is applicable to Cars, 4X4’s & Light Commercial Vehicles up to 3.5t only. All Products and Services purchased using the Student & Graduate Discount must be fitted and/or carried out at the ATS Euromaster Service Centre at the time of purchase. Please ensure you mention that you have an NUS Extra Card/Graduate Extra Card to the ATS Euromaster Service Centre prior to requesting prices. ATS Euromaster reserves the right to withdraw or change the Student & Graduate Discount scheme at any time without prior notification.